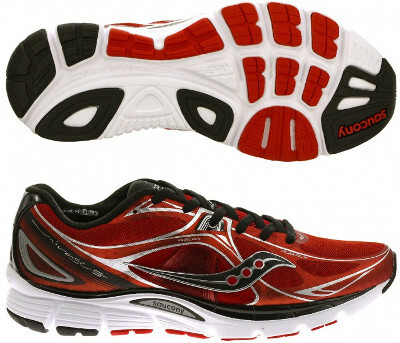 Saucony Mirage 5 are stability performance running shoes. The Saucony Mirage 5 offers light cushioning and great response with some guidance for runners looking for mild pronation support. It shares not only technologies and materials but also natural running spirit (just 4 mm offset) with its famous relative for neutral runners, the Kinvara 6. Upper has been upgraded from its predecessor the Mirage 4 with an open mesh with FlexFilm™ overlays for lightweight, seamless feel. It also includes Pro-lock™ straps for improved midfoot fit. Rest of Mirage 5 keeps same features with full length PowerGrid™ foam on top of EVA+ to provide a durable and responsive cushioning in the midsole for great comfort. Interior lining from both ankle collar and tongue are made of RunDry™ materials for great breathability and odour control resulting in optimal sanitation.